The silver-plate finish of the AE190S provides a controlled brilliance to the overall sound. Whether playing the Haydn concerto or souring over an orchestra, the AE190S Eb trumpet is the perfect choice. No other brand evokes more passion, loyalty, and respect than Bach Stradivarius. Exceptional tonal color, balanced response, and superb projection are the hallmarks of designs by Vincent Bach. Carrying on the legacy and true to the vision of the master craftsman, the makers of today's Bach Stradivarius proudly introduce the Artisan Collection. Skillfully handcrafted, Artisan culminates in a unique blend of classic design, elegant styling, and the signature Bach sound. Whether a passionate enthusiast or performing artist, experience The Artisan Collection and discover the Artisan within. Each Artisan Eb trumpet is made with a one-piece hand-hammered yellow brass bell with a flat rim and special acoustic treatment in both material and manufacturing process resulting in a beautiful Bach Stradivarius sound with a larger core and a broader range of color. The two-piece valve construction with nickel balusters and brass casings harkens back to the construction techniques used by Vincent Bach when making classic Bach trumpets in New York City and Mount Vernon, New York. Monel pistons along with two sets of brass and plastic valve guides offer the player a choice in response and feel. The 3rd valve tone enhancing ring offers yet another choice in response. The 1st slide split ring, enhanced radius ferrules, sculpted bracing, and artistic engraving are all key contributors to the unique response while providing an unparalleled elegance in appearance. Provided with two main tuning slides, the straight and dual slides offer the player a choice is resistance and response. The silver-plate finish of the AE190S provides a controlled brilliance to the overall sound. 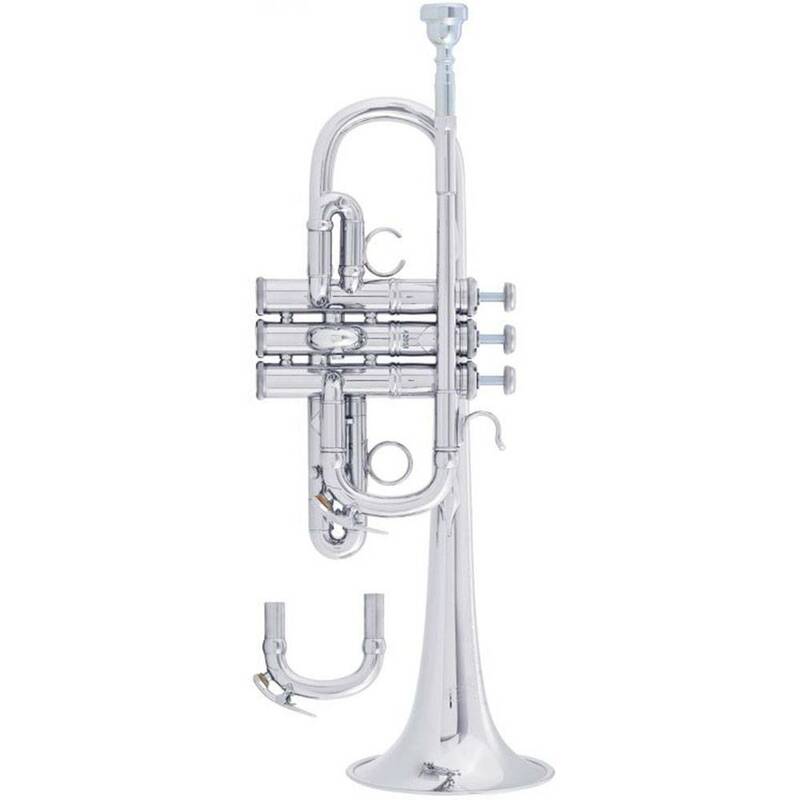 These features combined with a unique .462" large bore allow the player to have the ease of playing and feel of a C trumpet but with a warm characteristic sound of an Bb trumpet. Whether playing the Haydn concerto or souring over an orchestra, the AE190S Eb trumpet is the perfect choice. Bach "Stradivarius Artisan" - C trumpet, .462" large bore, 4-13/16" diameter one-piece hand-hammered yellow brass bell with flat rim, special acoustic bell treatment, enhanced radius ferrules, Monel pistons, 2 sets of valve guides - brass/plastic, 1st slide split ring, 3rd slide pin stop, 3rd valve tone enhancing ring, deluxe engraving, silver-plate finish, C190E deluxe case, no mouthpiece.